Is pyar ko Kia naam don? ???? Gillyaan uraa di! 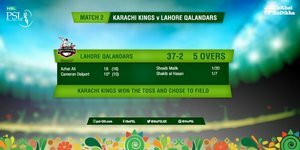 @BCBtigers superstar @Sah75official beats @AzharAli_ on the charge to pick up @KarachiKingsARY 's second wicket.